Winter Water Factory‘s organic goods, including rompers and snapsuits, are beloved for their chic patterns and prints. Now the company has expanded their collection to offer organic crib sheets, and they are as stylish and refreshing as you’d expect from the Brooklyn-based WWF. With designs including cars, birds, butterflies, boats, airplanes, trees, and mushrooms, there are twenty-five different options, all so adorable that you’ll want to stock up on extras for your family and to give as useful and luxurious baby gifts. The soft and fitted jersey sheets are just the thing for your little one to snuggle against at naptime and bedtime and are made in the United States from GOTS-certified organic cotton. If you are especially into the matchy-matchy vibe, you can pair up the crib sheets with a cuddly animal lovey. Creating the ultimate Instagram-worthy nursery may or may not be on your list of aspirations, but Winter Water Factory’s designs go a long way in making a snap-worthy and sustainable bedding choice easy to accomplish. Winter Water Factory's organic goods, including rompers and snapsuits, are beloved for their chic patterns and prints. Now the company has expanded their collection to offer organic crib sheets, and they are as stylish and refreshing as you'd expect from the Brooklyn-based WWF. With designs including cars, birds, butterflies, boats, airplanes, trees, and mushrooms, there are twenty-five different options, all so adorable that you'll want to stock up on extras for your family and to give as useful and luxurious baby gifts. The soft and fitted jersey sheets are just the thing for your little one to snuggle against at naptime and bedtime and are made in the United States from GOTS-certified organic cotton. �If you are especially into the matchy-matchy vibe, you can pair up the crib sheets with a cuddly animal lovey. 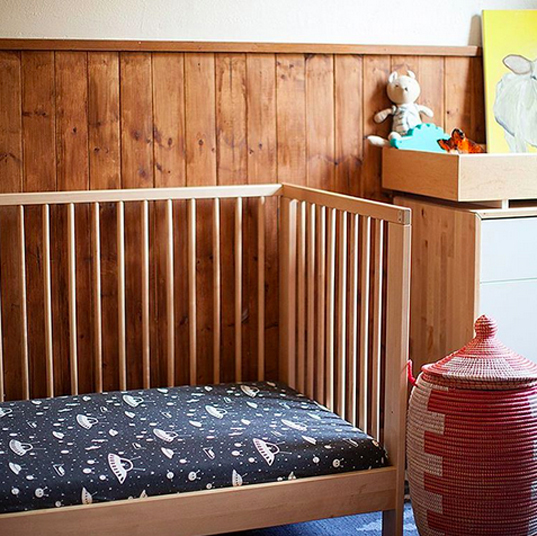 Creating the ultimate Instagram-worthy nursery may or may not be on your list of aspirations, but Winter Water Factory's designs go a long way in making a snap-worthy and sustainable bedding choice easy to accomplish.